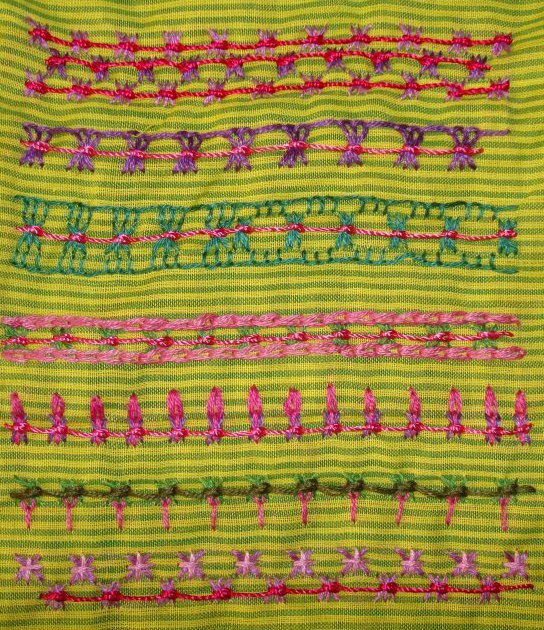 More details of knotted Cretan stitch sampler. 3.Knotted Cretan stitch is worked in two rows in the top. And the next one, two rows of knotted Cretan stitch worked one over the other. the first row, the two rows of knotted Cretan stitches are facing away from each other, first I started working them very closely, though they looked great, I may not be able to decipher their working at a later date, so worked them with some space in between. The second row, same as the previous row, except the starting and the ending point of the two rows of the stitches are the same . The third row, I worked each knotted cretan stitch seperately. 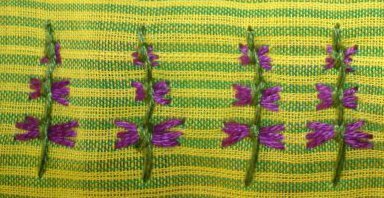 This week’s stitch is knotted cretan stitch on the TAST 2012 stitch challenge by SharonB. I have not done this stitch before. This stitch was also a part of the earlier TAST challenge. Now is the chance for me to work on this stitch. 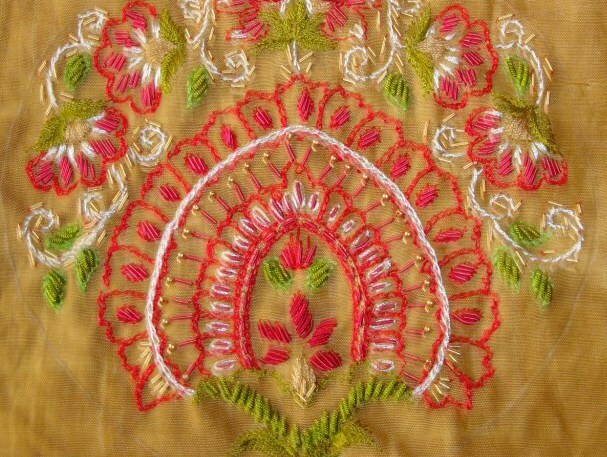 I am planning to work this stitch on even weave fabric with cone thread[ similar to perle cotton]. 2.in the first row, one part of the stitch is worked with varying heights. The next row, I grouped three knotted Cretan stitches together. 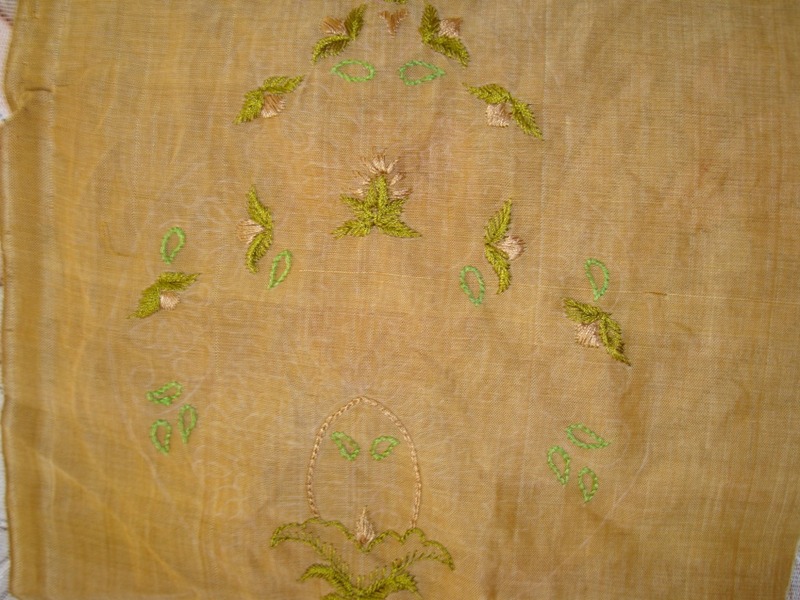 The other part of the yoke after working the zardosi embroidery. The pictures are not very clear. 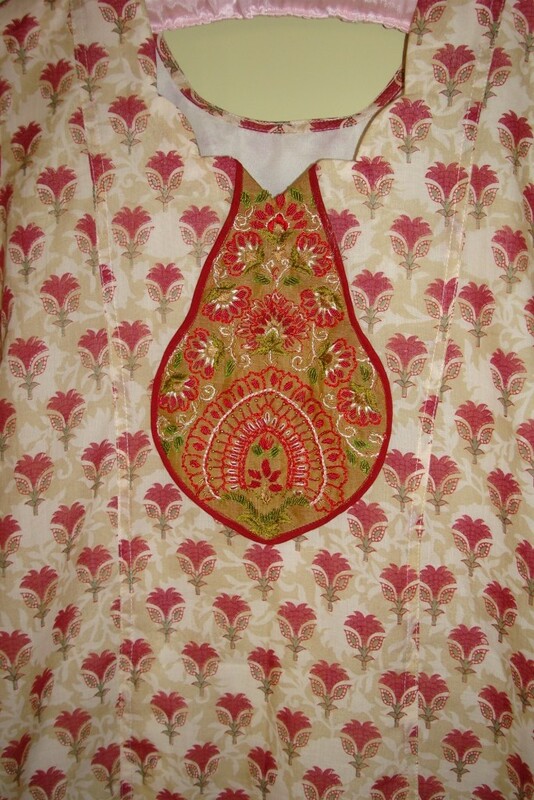 The sewn tunic with zardosi yoke. Close up of the tunic. 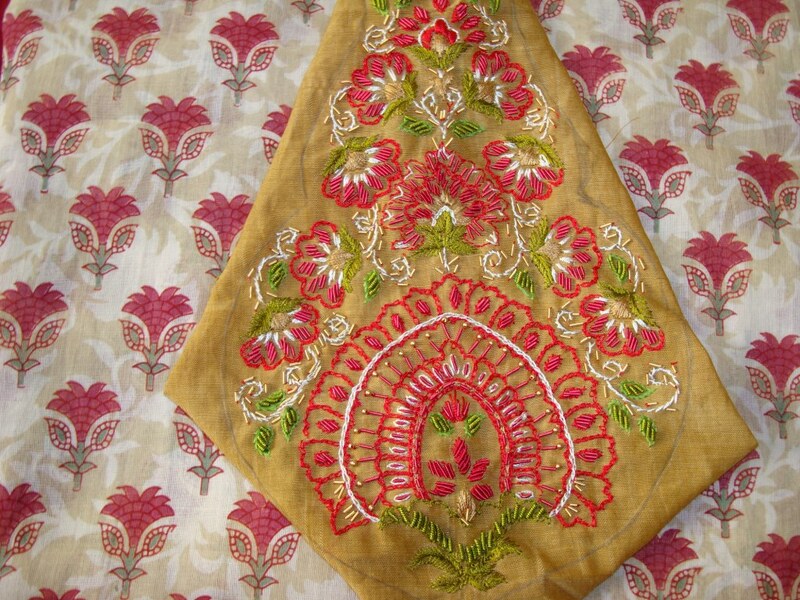 I have worn this tunic with red salwar[Indian pants]. 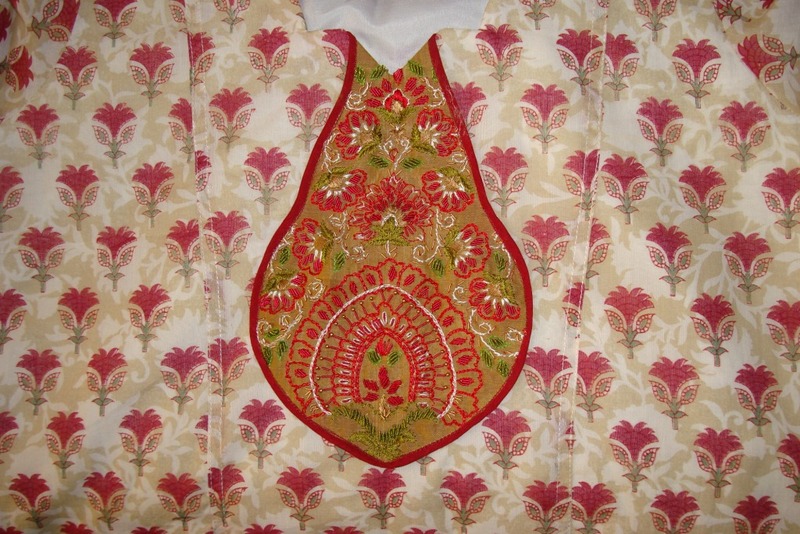 The block print pattern on this tunic is very rare. It impressed me a lot. it can worn be as saree, shirt, short top and other western dresses also. The fabric was transparent and required lining, for that matter. I find any white based fabric requires lining. I looked for inspiration from traditional Indian patterns and drew this yoke pattern. 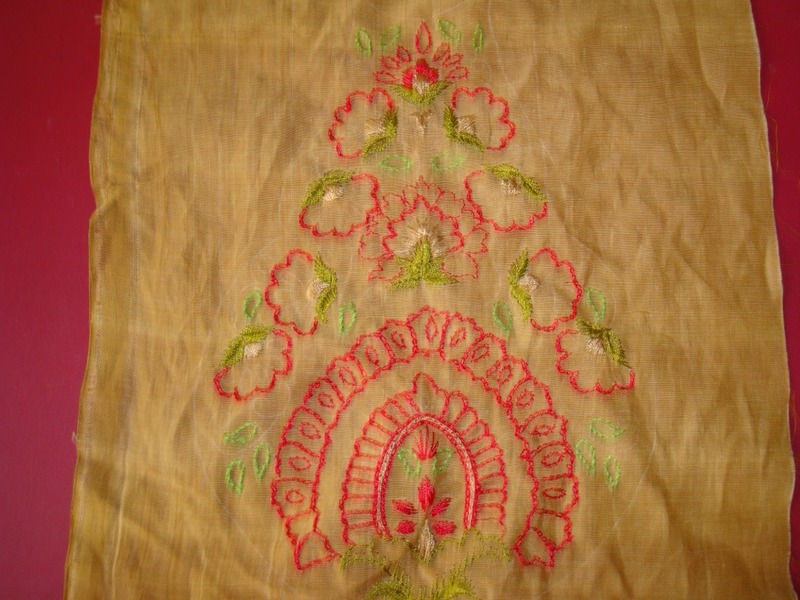 With the tunic fabric in white, the rest of the design was worked in white thread. The stems were done in white along with other small details. The zardosi details on my next post. 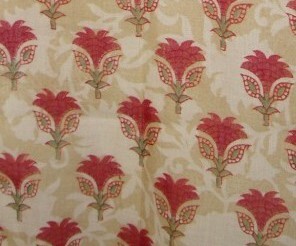 While shopping for tunic fabrics, I found this white block printed chanderi fabric. It had small zari border.which is not seen here.. I had some zardosi tubes in red, which I wanted to use on this tunic. With white background, I cannot use white fabric for yoke, light green colour was very minimal on the tunic to be used for yoke, so the decision was to use golden yellow fabric for yoke. 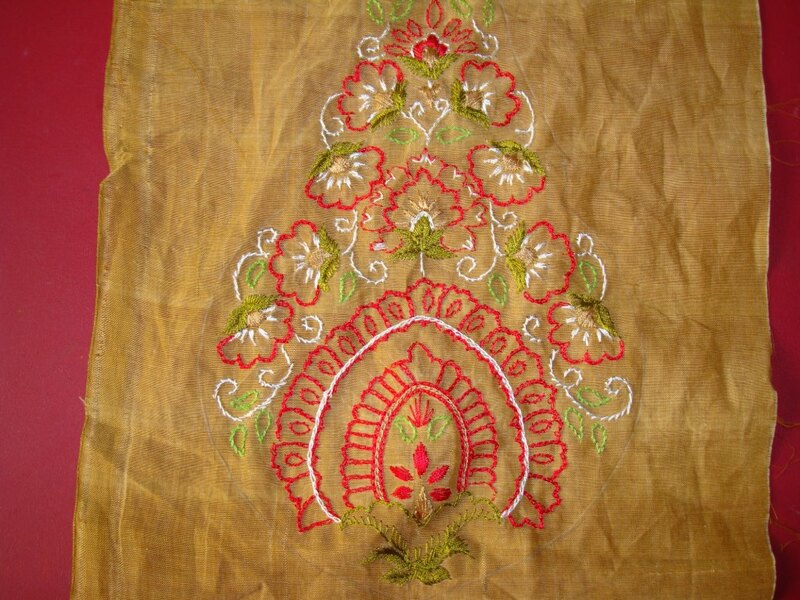 This was a traditional Indian pattern, it is easier to incorporate zardosi on these type of patterns. 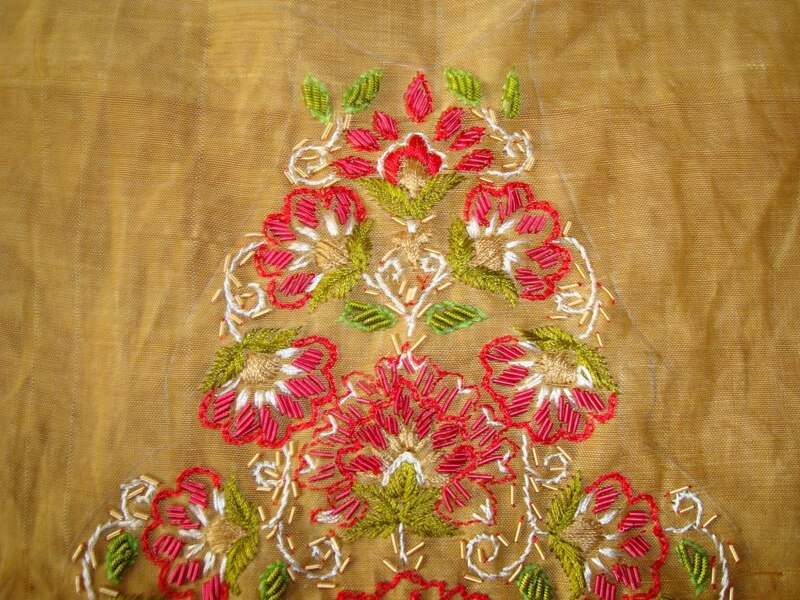 I started the work with gold colour silk thread. Satin stitches, straight stitches and chain stitch were done with this thread. The next colour silk thread was olive green, and the light green was done in cotton skein. Leaf stitch, stem stitch and buttonhole stitch were done with these threads. Today I did some more butterfly chain stitch samples. These were also done in combination with other stitches. The last part of the sampler. 8. after working a row of butterfly chain stitches, a row a of herringbone stitch is worked beneath it. 9. first, three fly stitches are worked together in two directions and butterfly chain stitches are worked on their tails. This way ,one side has a fuller look. 10. a row of zigzag back stitch is worked over a row of butterfly chain stitches. 11. a row of three individual herringbone stitches are worked together , over them butterfly chain stitches are worked on both sides . 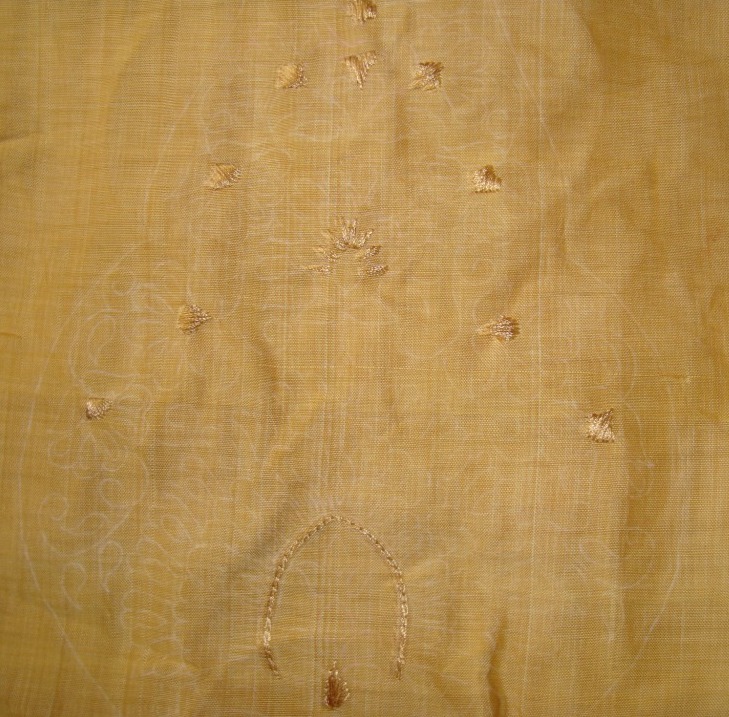 12. three butterfly stitches are worked together to form a motif. This variation was a surprise. 13. I tried working whipped wheel stitch on both sides of butterfly chain stitches. 14. this is a combination of butterfly chain stitch with stem stitch. 15. the butterfly chain stitch with beads. 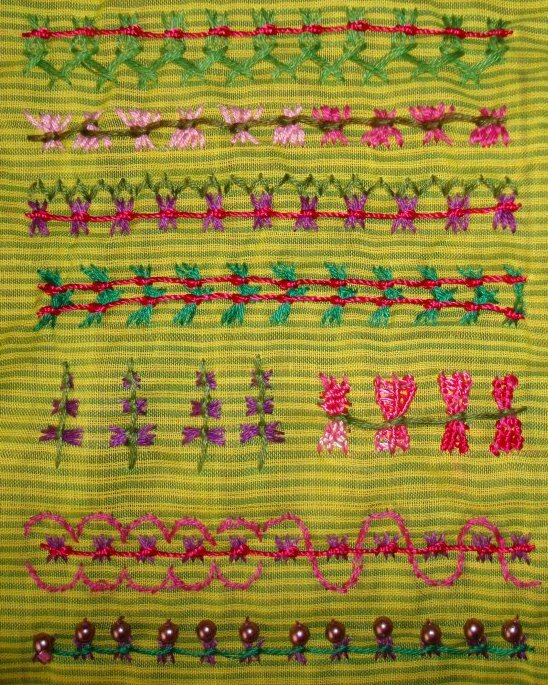 This week’s TAST 2012 challenge stitch, butterfly chain sampler is completed with this row. This stitch was an easy stitch to work with. I worked the straight stitches in cotton skeins and the twisted chain in perle cotton. This striped cloth was too bright to work with more colour combinations, a lighter colour would have given me more options. I learnt this lesson from this. I had done some variations of this butterfly chain stitch when it was part of the earlier TAST challenge. This time around, I tried working this stitch with other stitches. 1. the first row, three rows of butterfly chain stitches, the second row, I tried working butterfly chain on buttonhole stitch. 2. two versions for working butterfly chain stitches between two rows of buttonhole stitches. 3.butterfly chain stitch is worked between two rows of chain stitches. 4. A long tailed detached chain stitch is worked between the straight stitches, and butterfly chain stitch is worked on it. 5. Long tailed fly stitch is worked between the straight stitches, and then the butterfly chain stitches are done on them. 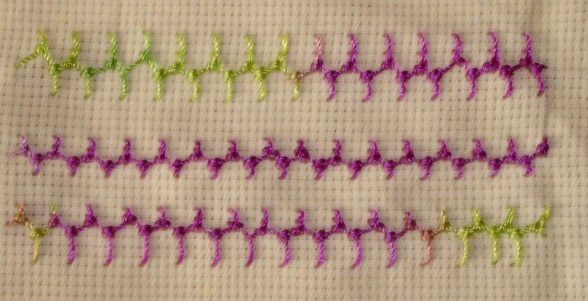 6.Butterfly chain stitch is worked along with double cross stitch. Will try some more combinations.